More like the poo poo platter. Am I right? Anytime you leave a place, you want to end on a high note. In the Cook Islands, we were planning on doing the same. After dropping off our motor bike and heading back to our hotel, we had one more meal in us before catching out red-eye back to the homeland. Fortunately, there was a restaurant in walking distance that had been recommended to us by a local and by a couple of travelers. 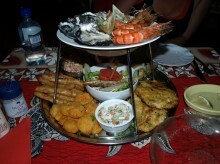 It was called Tumunu and boasted a seafood platter as its house special. Situated in the village of Tupapa on Rarotonga is an old colonial home. Built back in 1910, at one time, it was even the home of the British Consul. But all that changed in 2004, when a couple of restauranteurs decided this old colonial home needed to serve up some food. Tamarind House was born, and has been dealing in Pan-Asian culinary delights ever since. When we got ourselves seated, we quickly learned that Tamarind House was going to be a unique experience, and not simply because we were in an old colonial home. 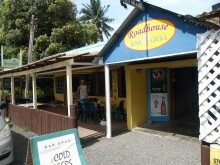 Little-known fact: restaurants in Rarotonga generally close their lunch doors after 2:00 pm. This fact would have been great to know before the girlfriend and I rode our motor scooter around half of the island in search of a late lunch. Just when we had given up hope, I recalled a place called Roadhouse that we had passed many a time on our way from our hotel to Avarua. If they were closed, we were just going to have to snack ourselves away until dinner time. Fortunately, Roadhouse was open (from 11 am to 2 am every day) and sadly devoid of Patrick Swayze (RIP). 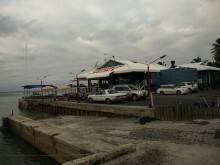 In the windy town of Titikaveka, there is a restaurant called Little Polynesian, that also doubles as a hotel. 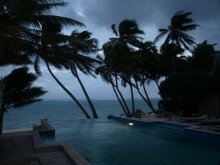 Just like nearly every spot on Rarotonga, Little Polynesian offers amazing views of the ocean and numerous palm trees. While fine views are usually followed by only decent dining, Little Polynesian was supposed to be quite good, and we hoped the meal would be half as good as the view. 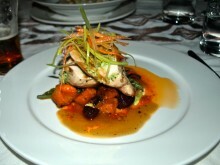 Just as we had done at Windjammer, a quick look at the menu made us realize that this was a meal for splitting. We ordered two dishes and an appetizer, then sit back, relaxed and soaked up our evening of Little Polynesian. One amazing thing about Rarotonga in the Cook Islands is the lack of chains. No Starbucks. No Subway. No McDonald’s. It’s enough to make a coffee-loving, fast food-devouring American feel dizzy. Fortunately, I don’t care for coffee and this also doesn’t mean Rarotonga doesn’t have fast food. Yes, even this slow-paced island that runs on even slower-paced “island time” is not without its fast food, but this fast food is local. Our awesome bartender/sample-giver from the Cooks Lager Brewery, Wendy, recommended Palace Takeaways. Situated on the outskirts of Avarua, this little shack served burgers, fish and chips and not much else. Wendy told us they were the best burgers in town, so I had to find out for myself. 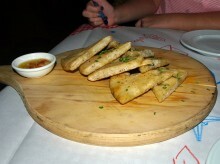 For some reason, despite being on a tropical island, Bina was craving Italian food. Perhaps it had something to do with the fact that we had a 15% off coupon to Spaghetti House or perhaps it had something to do with taste buds. Whatever the case, I was happy to mix up our Rarotonga grubbing with something different, so we walked on over to Spaghetti House in Arorangi to see what sort of Italian the were serving. I’d get moored here anytime. 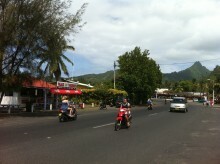 Riding around the single loop road of Rarotonga can make an unvegan man hungry. 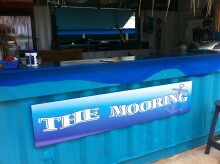 Fortunately, when the hunger arose we were in the town of Avana and saw a sign for a cafe called The Mooring. Situated on the sea about two seconds down a dirt road, The Mooring is little more than a shack, but a shack with great outdoor seating and a view of Avana Harbor. A man sitting at one of the tables who seemed to belong to the place told us that all of their fish had been swimming in the sea mere hours before, so it sounded like we had stumbled upon the right place. When we first arrived in the Cook Islands, we asked our airport driver where we should go to get a good meal. Hoping to get some sort of local insight, he recommended Trader Jack’s to us. 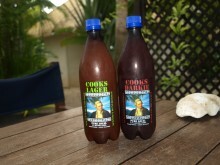 His sentiments agreed with the brief food research we had done before coming to Rarotonga – Trader Jack’s was a must-eat. It took us until day two to get there, but when we got there we found it nicely situated on the shore of the Pacific with a beautiful view of the mountains in the background. And after half a day of hiking those mountains with Pa, it seemed to be just what the doctor ordered. Yes, there is some chicken buried in there. 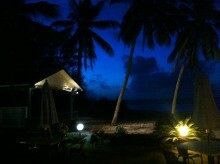 Situated on the grounds of the Crown Beach Resort is a nice, large thatch-roofed building with a restaurant inside. The restaurant is called Windjammer and in the town of Arorangi on the island of Rarotonga, the thatch roof fits right in. As with much of the food I would encounter in Rarotonga (which relies heavily upon imported food from New Zealand), eating out doesn’t come cheaply, with main courses hanging out around 30 New Zealand Dollars. Rather than settling on one dish, the girlfriend and I decided to go splitsies on two. In the Cook Islands, 90% percent of the beer consumed is imported. Sure, most of it just comes from New Zealand, a mere three hours and International Date Line away by flight, but it is still shame when you consider the small island of Rarotonga has not one, but two breweries. One of these is the Cooks Lager Brewery and it is nothing like any brewery you’ve seen before. It resides in an old supermarket in the town of Avarua and has only existed for less than two years (replacing a defunct Cooks Lager brewing company that had shut down years before). Yet, in those two years, the five-man operation of Cooks Lager has begun to make its dent in the local brew scene.